Gold Prices at 300-Year Low! Gold priced at $1,200 an ounce, when adjusted for real inflation, is almost as cheap as it was in 1999 at the $250/oz. low! 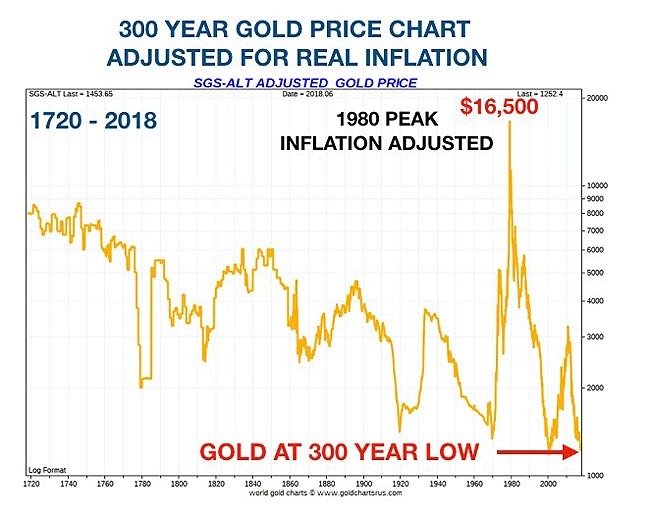 More importantly, gold's inflation-adjusted price is very near the 300-year low. Right now gold is overlooked and undervalued and therefore, a great bargain. Gold's high of $850/oz. would today be $16,650 on an inflation-adjusted basis. Owning physical gold as wealth protection is the best kept secret on Wall Street. 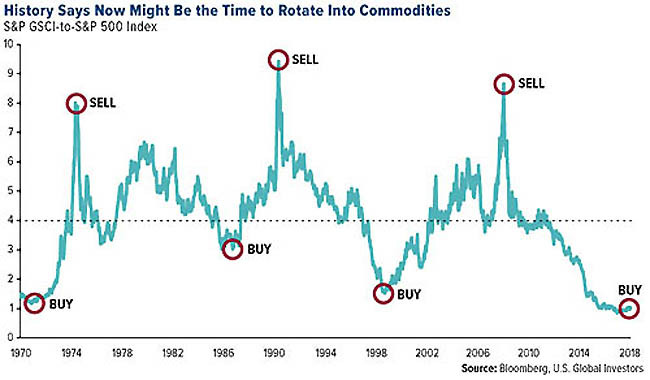 Now look at this 'Buy' and 'Sell' point commodities price chart between 1970-2018. It illustrates the huge wealth transfers that takes place when hard assets are back in favor. Gold typically experiences large advances following each of the 'Buy' points trigger. Now is the time to take advantage of gold's weakness to add to your physical holdings! This major gold price bottom will not last much longer. Call Swiss America at 800-289-2646, or register here for a free copy of "The Timeless Truth About Gold & Silver"